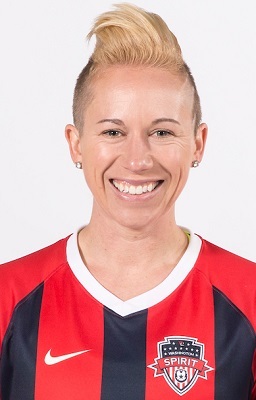 The Washington Spirit selected Joanna Lohman off the NWSL Waiver Wire after she was waived by the Boston Breakers at the end of the 2014 season. Prior to her NWSL career, the Washington, D.C. native had multiple stints playing for the Washington Freedom, D.C. United Women, and Philadelphia Independence. In addition, she served as the general manager of the Washington Freedom Futures, the Washington Freedom Soccer Club’s W-League team. Lohman is a former member of the United States women’s national soccer team. 2018: Appeared in 13 games for the Spirit, starting four. Over 429 minutes, Lohman won her tackles at an impressive 83% rate, made 10 interceptions and blocked four shots. Lohman also completed her passes at a 74% rate on the season, completing 167 passes. Lohman scored in the first game of the season, the lone Spirit goal in a 2-1 defeat away at Seattle. 2017: Sustained a season-ending ACL injury in the Spirit’s regular-season opener on April 15, 2017, against the North Carolina Courage. Previous: Made 39 total appearances in 2013 and 2014 for the Boston Breakers in the NWSL…Played for DC United of the USL W-League (2012) and RCD Espanyol of Spain’s top-flight La Liga Feminino (2011/2012) … Made 21 appearances and scored three goals for Espanyol … Made five appearances, logging 391 minutes for DC United … In Women’s Professional Soccer (WPS), played for the Philadelphia Independence (2010 and 2011) … Made 24 appearances (20 starts) in 2010, scoring five goals, which ranked her second on the team … In 2011, made 10 appearances … Helped lead the Independence to back-to-back appearances in the WPS Championship … Debuted in WPS in 2009 for the Washington Freedom and made seven appearances … Initially drafted by WPS club Saint Louis Athletica in the 2008 WPS General Draft. Rights were later traded to Washington … Played for Swedish club Balinge (2008) … Member of 2005 Freedom Reserves … Played in WUSA Festivals in both Minneapolis and Los Angeles in 2004. Played for Penn State University (2000-2003) … Scored 19 goals and had six assists her senior season at Penn State, finishing career No. 5 in all-time goals scored (41), No. 2 in assists (37), No. 4 in points (114) and first with eight game-winning goals … Named Big Ten Player of the Year (2003) … First Team NSCAA Academic All-American (2001-2003) … Two-time Mac Hermann Trophy and Honda Sports Award finalist (2002-2003) … First Team All-Big Ten (2000-2003) … Three-time NSCAA All- America selection … 2000 Big Ten Freshman of the Year. Named NCAA Woman of the Year in 2004 … One of three recipients of Penn State’s Outstanding Senior Athlete Award in 2003.